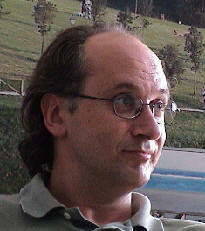 ALFREDO COLUNGA is a scriptswriter and coordinator of projects in modern media and audiovisual languages. Among his most recent work, carried out in conjunction with the production company Mana Visual Audio, is the development of the Tesseract platform (an anti-postmodern audiovisual machine) and the audiovisual series “Philosophical stories for the 21st century” (the first of which, titled “The missing word”, was shown during the Transvision Conference 2003). He also directed and coordinated the expanded cinema project afterall.tv (www.afterall.tv), presented in the international art biennial in Turin 2002, and the video-sculpture “Tumulus for the last homo sapiens”, which will be presented at the modern art fair ARCO 2004, in Madrid. He holds a degree in Technical Industrial Engineering from the University of Oviedo, in Spain. In that same university he also went on to study Philosophy and History, subsequently specializing in media and audiovisual languages. He has written and made more than 60 audiovisuals for scientific divulgation, for which he has received numerous prizes and awards. Let us imagine – Mr G started, without further ado – that human beings grow and expand, transcending their current form and even, finally, conquering and dominating the universe. A universe which, if it is as we currently conceive it, came out of a big bang and is destined to either expand eternally, to cold and entropy, or to close in on itself symmetrically in a big crash. If the first option is correct –continued Mr G–, with the end of the universe we would have effectively arrived at The End of History (Mr G here alluded to the title of a famous book that annoyed him especially. The title, not the book, which Mr G had not read). However, supposing that the second option were correct and a great crash were waiting behind the end of all time, human beings, by that time superhuman, would then be faced a concern which we know well, because in fact, although not always consciously, it is also our great concern: transcendence. Those superhuman beings would have calculated that “after” the big crash would come a new big bang. Mr G pronounced the word “after” with a special intonation. Trying in that way to insinuate that, given the limitations in available language, he saw himself forced to use a word with temporal connotations which were obviously inappropriate – And not just that: due to their knowledge far beyond our comprehension, those beings would have achieved, unable to move themselves, to send to that new universe, skirting the known limits of physics, a “print” or mark, a key which would finally lead, from among all the possible subsequent universes, to a specific one which, certain limits between chaos and order prevailing, were able, following a reduced number of rules, to develop and sustain itself in a manner similar to its predecessor. All of this with an objective: this universe, after eons of laborious development, would bring forth, finally, a sign, a proof that before, in another universe, other intelligent beings had existed. Naturally – added Mr G – this print would also be designed to be transmitted indefinitely, from universe to universe. While speaking these words, Mr G was somewhat concerned, since –I haven’t mentioned it before - the invitation took him to a country far from his own, whose language, in which he was trying to express himself, he had only a passing acquaintance with. Mr G, nevertheless, knew that his audience acknowledged his efforts, and he carried on. – The question is – he went on to say – Where to leave that print? Or, more specifically: Where to make it appear, manifest itself, to be sure that, when the time came, the emerging intelligence in the new universe would find it without fail, thereby comprehending the inheritance it had received? Mr G enjoyed asking that question, as it is known that sometimes a good question can be more satisfying than the answer. But, not wanting to try his audience’s patience, he carried on. - I will attempt to set forth an answer: the ideal place to leave that proof so that it would be discovered, without a doubt, by the first beings with sufficient intelligence arising in the new universe, the place where, in fact, those intelligent beings, sooner or later, would look for it, would be, naturally... incrusted in the deepest part of the genetic code. Let us then propose geneticists to search and search well, as it is possible that, in among all the genes, they will find a slightly unusual one, a gene that is just slightly different, showing a small, probably minimal, subtle and unexpected difference from its fellow genes. Take a good look, because it will not be a gene like all the others, but it will be – and here Mr G placed special emphasis on his words - the treasure box. Then let us find the key and, if we can, let us open the box and examine it, because inside we will find, may be, the answer to all our questions, past, present and future. Although, it can also occur– Mr G hurriedly added, not wishing to create expectations in excess - that after searching and searching, the geneticists finally give up and, disheartened, admit that the special gene does not exist. At that point we would have to accept one of two options: the first is that that secret message does not exist. We will have to conclude then that, either our universe is the first able to attain such a high level of complexity, or that universes are condemned to disintegration without trace. Although there is also a second option, more reassuring: we must not rush if, in spite of our searching, we do not locate that sign in our genes. It may be still too early to take it out and look for it and, perhaps, the message is written in an even more basic, more fundamental code, and its discovery and interpretation require tools and a language which are still not yet within our grasp. That is why – insisted Mr G – if we are not able to find it, if that special gene isn’t visible to our eyes, we must not worry: we will just have to wait until we have more and better technical resources, until the message, finally, becomes visible and can be read by our successors. But let’s suppose for a minute– continued Mr G – let us suppose, I say, for a minute that our gifted geneticists, generously financed and putting all of their considerable talent and energy to work, not only find that different gene, that treasure box, but that, in addition, they also find, and most important, the key that would open that box. Well... things, certainly, would get interesting... the time would then have come to ask ourselves the big question... What could we expect to find inside that box? What could we hope to find inside it? What is the greatest secret that, from our knowledge and expectations, we could imagine finding? - Mr G once again paused, very briefly this time, to gather strength, and went on. - Naturally, it couldn’t be anything physical, voluminous... but rather, a series of instructions. Mr G thought that maybe at that point some members of the audience would be, somehow, disappointed... Instructions!, some would think... I never! Tell us, if you can, what instructions, and if not be quiet! But Mr G hadn’t come to talk about those instructions and, for his purposes, no greater specification was required in this respect. In any case, he admitted, he wouldn’t have been able to be more specific. Derived from a technology far superior to ours – he continued – we would not know exactly what those instructions would consist of, or what they would mean, or even why they took that form. We would not know what they were but, as usual, we would soon find out what they were for... Pleased, proud of our ability to unfold the mystery (and scarcely grateful, truth be told, to our predecessors), we would rapidly understand that those instructions enclosed... the secret of constructing universes. Before we realized it, we would have engendered hundreds, thousands, millions of universes subject to all the possible laws that we were able to imagine. But – Mr G suddenly remembered – even after seeing the birth and death of them all, humans would still not really know what the box held. We would still not know what was, exactly, the greatest treasure in the world. Naturally, by that time speculations of all sorts would have been developed, and, consequently, attitudes: some, asserting that it would never be known, because those who constructed it were superior to us, would consider appropriate to give up trying to understand what was inside and merely express our gratitude for its existence. Others, simply, would give up trying to understand and, with no further fuss, would enjoy the privilege granted. Some would even deny that those beings had ever existed, and would affirm that the box, in reality, was completely empty, and that all the universes emerging around were sheer illusion. The greatest treasure box ever imagined – the entry stated -, was, naturally, brimming… with keys to the boxes with the greatest treasures ever imagined. This answer, they agreed, not only responded to the question posed in the contest, but also served to close a long road, a long treasure hunt that had begun centuries earlier, with stories of complex cryptograms and buried treasures. Which continued later explaining in a thousand different ways that the gold in those treasures was, in reality, nothing more than a symbol behind which our passions were hidden, passions that in turn were progressively revealed as our search for options in the fight for survival. And which ended now by showing, very wisely, that survival was not only the beginning but also the end: eternal multiplication beyond which nothing can be hoped. Accepted this answer, in the first world everyone felt a bit more intelligent although, truth be told, somewhat sadder too. -In the second world things were approached differently- he finished. There they decided that, if they did not yet know what was in the box, they would not rush conclusions and would work towards finding it out. So, after taking care, in the first place, of their own survival, they started to study what was in their surroundings. They observed that the sign was found, in identical form, not only in every man, but in every cell of every living being around them, thereby linking all the species: each plant, each bird, each insect or lichen. And they concluded from this fact that, in the same way that the sign had appeared before their eyes, it could have done so before any other species which had developed to a sufficient degree. From this they deduced, in turn, two things about themselves: that their appearance was fruit of a tendency which, in one way or another, had been expressed, and that the form which their species adopted was purely contingent, an accident: one among many possibilities. They also observed that any modification, small as it may be, to the conditions in which their universe had been formed, to the rules of the game, would have impeded that the sign, or they themselves, existed. This encouraged them to think that both the sign and they themselves had a natural tendency to appear in the same universes. They also observed finally that the treasure had appeared to them just when they were beginning to understand life as knowledge itself, to germinate them with their own hands. A powerful tool that, they presumed, would soon give them abilities that they could hardly imagine. They needed no more. It was easy for them to deduce that there was no treasure in the treasure box: the instructions did not hide a message, but rather they were the message. And they felt peaceful – concluded Mr G.- because they understood they were, precisely, the ones who had sent it. Yale Interdisciplinary Bioethics Program's Working Group on Artificial Intelligence, Nanotechnology and Transhumanism.